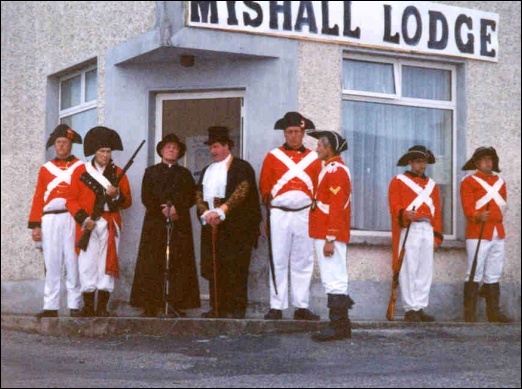 Towards the end of 1997 a small committee was formed to commemorate the bi-centenary of 1798. 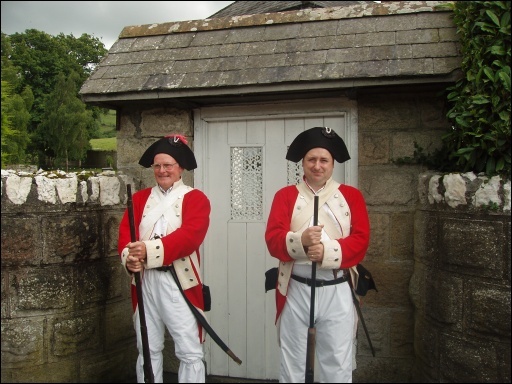 Their aims were threefold - to discover as much as possible about 1798 in this area; to commemorate these events and to attract tourists and visitors to the area for these commemorations. The following committee was elected: Chairperson: Charlie Murphy, Secretary: Brigid Fox; Treasurer: Sean Keogh and P.R.O. : Ena Jordan. However, like all small committees it had big ideas and all ideas focused around the two traditions that were known in the area relating to 1798 - the last Mass of Fr. John Murphy and the making of the Croppy Road. As this latter was thought to have been one of the first negotiations made through peaceful means the committee soon adopted a theme of “Roads to Peace and Progress”. It was decided to erect a plaque on this Croppy Road and to have a 200th Commemoration Mass in honour of the rebel Priest who honoured the area two hundred years before. Research into the period brought to light the type of life enjoyed by those who lived in 1798 and so the committee soon decided to resurrect that kind of life for one day by having what they called a “’98 Village Experience”. An article in the Carloviana by Brother P.J. Kavanagh, son of Dolly Nolan Myshall (Nolan’s Shop) provided further information on a Captain James Nolan who was leader of the United Irishmen in the area in 1798 and pinpointed his grave enclosure in Drumphea Cemetery. This prompted the committee to have this grave refurbished. Communication with historians Dr. Kevin Whelan, Sr. Maura Duggan Sion Hill College of Education Dublin and the aforementioned Brother P.J. Kavanagh provided further avenues to be explored by the local committee and letters written by Robert Cornwall of Myshall Lodge to Dublin Castle in the rebellious period were researched. 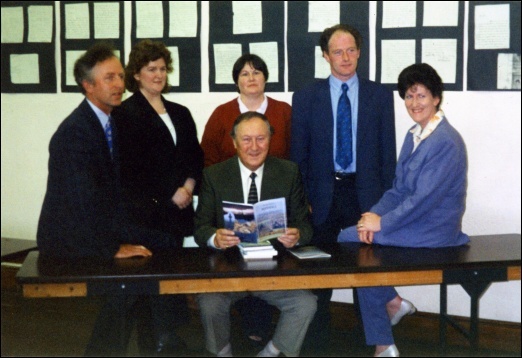 To finance the projects sponsorship was sought, and also successful applications made to the 1798 Office of the Department of the Taoiseach, Carlow County Council and B.N.S. (Barrow Nore Suir Leader 2). The local contribution was gained through the ‘98 Village Experience and two Cabarets. It cost in excess of £3,000 to finance the activities and projects. Apart from all the activities already mentioned the full schedule of activities carried out during the year by the ‘98 Committee included: Showing the film “When do you Die Friend” in Myshall Hall on Feb. 18th; Refurbishment of Captain James Nolan’s Grave Drumphea and Fr. Bryan Kavanagh’s memorial at Myshall Church of the Holy Cross; Oration and Wreath laying in Drumphea; Erection of Plaque on Croppy Road designed by local artist Anne-Marie O’ Toole and erection of three finger post signs indicating Croppy Road; Lecture on 1798 and launch of Tourist Trail Booklet “Discover Myshall” by Tom McCoughren, Mass at Corrbuí Gap; Parade of Pike people from Corrabuí Gap to Myshall which included not alone those from our own area but also from Clonegal, Rathanna, Idrone Pikemen, Bunclody all led by the Ballindaggin Pipe Band; Street Theatre Performances on July 5th after the parade and Mass and workshops for same; this Street Theatre incorporated over sixty people which featured scenes from 1798 including Robert Cornwall and his troupe of Redcoats; United Irishmen, Dancers, singers, school children singing songs of peace - all co-ordinated by a narration given by Town Crier John Nolan; the research, exhibition and printing of Letters of Robert Cornwall and exhibition of a Folklore Exhibition entitled “le Dúil sa Dúchas. The former was carried out through the generous sponsorship of Avonmore/Waterford Plc. and with the kind permission of the National Archives while the latter was with the kind permission of the Folklore Dept. of U.C.D. and contained some writings from children who attended the local primary schools in the 1930’s. 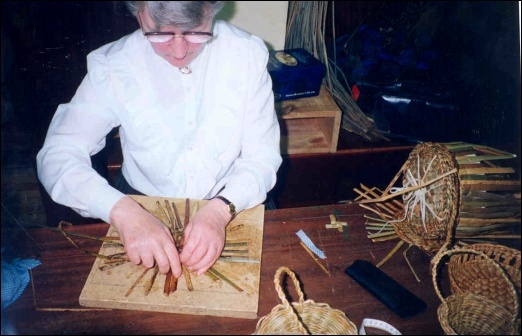 The ‘98 Village Experience featured twenty crafts which have survived from 1798 with many demonstrated by local people. 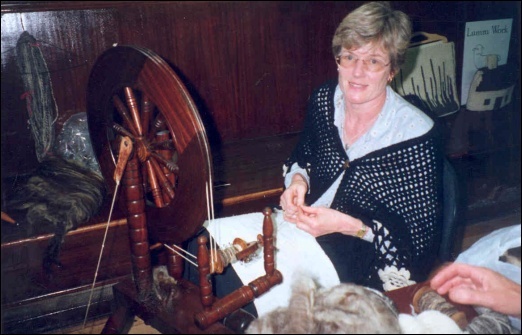 Margaret Doyle Carlow Road learned how to spin on an authentic spinning wheel for the occasion. 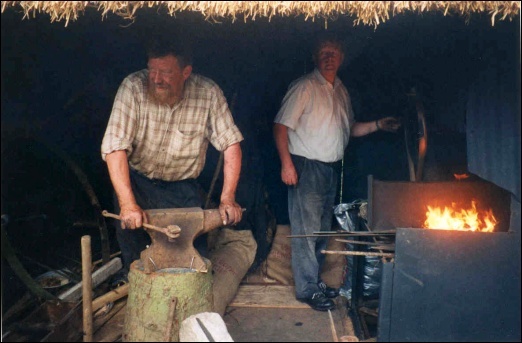 The “Village” also contained a Shebeen, an old-fashioned kitchen complete with Pig’s head and feet and dairy where real Irish butter was being made with the churn and separator. Hundreds of people attended the various events with many travelling from Counties Carlow, Wexford, Laois and Kildare. 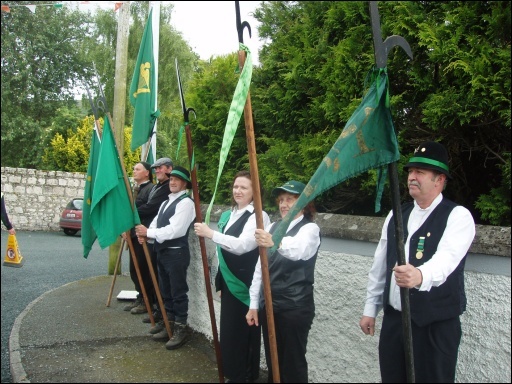 Groups of Pike people from this area also attended the commemorations and marched under the Myshall Banner in other neighbouring areas most notably: Clonegal, Carlow Town, Killanne, St. Mullins, Kildavin, Kilcumney. A group of 34 people both young and old participated in the St. Patrick’s Day Parade in Bagenalstown and won a prize in the marching groups section. 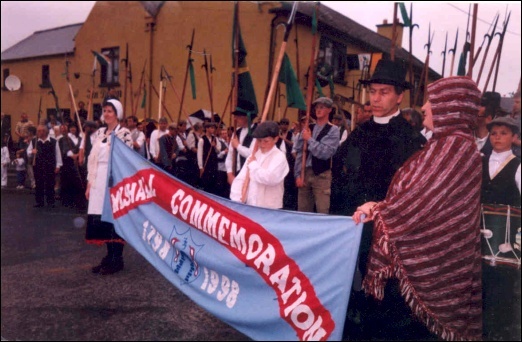 The pageant included pike people, float with spinner (Margaret Doyle), Croppy Boy (Jimmy O’ Neill), Blacksmith (Tommie Murphy) and children and teenagers who marched under the Peace and Progress theme. 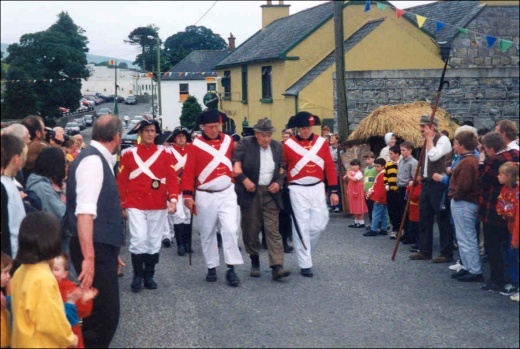 The committee could not have organised the above without the help and co-operation of the whole community particularly for the events of July 5th (Mass, Parade & Street Theatre) and July 12th (‘98 Village Experience). A Christmas 'Thank You' Party for all involved was held in Roberts Lounge Myshall on Dec. 19th. 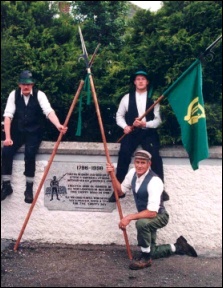 At the end of the year the successful ‘98 committee dissolved with a hope that the Peace Process, two hundred years after the fall out of Nationalism and Unionism, based on sectarian lines, which began in the 1790’s could succeed where the ideals of the United Irishmen failed and we could lay 1798 to rest forever.